Aristo's Train Engineer remote control system is very popular and works very well. However the documentation is spotty at best. This page contains some more information on how it works and how to program it. 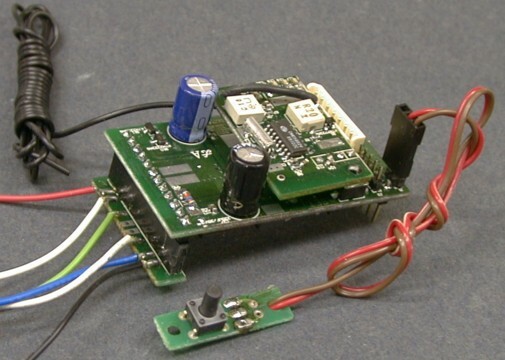 The Train Engineer is a device that is intended to be electrically inserted between your power pack and your track. Your power pack is then set to full throttle and left alone. The TE then controls the power delivered to your track and provides the advantage of walk around wireless control. Your track is still wired, but you are not. 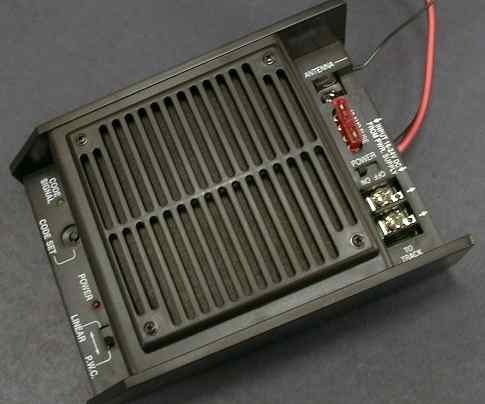 The new ART-5490 on board receiver is intended to be installed inside a loco and powered from an onboard battery or constant track power. The Train Engineer has been manufactured in three distinct versions. Each version has had increased capability while retaining some level of backward compatibility with previous versions. Each version has retained the same model number which leads to some confusion. The ART-5470 is the number for a transmitter and receiver pair when sold as a set. The receiver itself is called an ART-5471 and the transmitter itself is an ART-5473. The only way that you will know which version you are getting is to look at the product. Some retailers may still have stock of the older versions. If you order by mail, make sure that you describe the unit that you want carefully and make sure that the seller is selling you the version that you actually want. A retailer near me still has some of the original units in stock. As of early 2000, these units are sold under the Crest label and the model numbers have all changed. I haven't sorted out the changes yet so that all the model numbers listed below refer to the AristoCraft numbering scheme. The original version had a 3 amp power capability with a fairly small receiver. 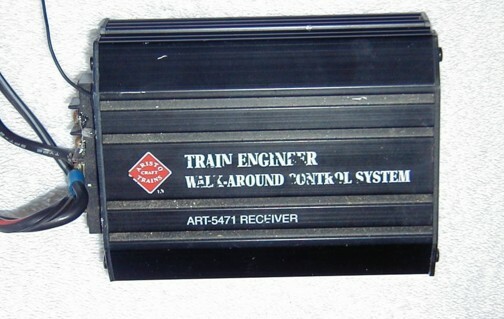 There was an accessory box that could be plugged into the original receiver that had similar capability to the current ART-5474 Accessory Panel. 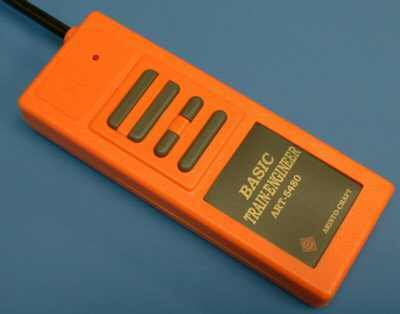 The second and the most widely used version of the TE has a full 10 amp capability and the programming was simplified somewhat. The receiver is larger than the original version. The TE system operates in the Citizens Band at 27 MHz. The first two TE versions ship with crystals for CB channel 4 so that any transmitter can communicate with any receiver. The crystals can be changed but it will prevent the modified units from communicating with unmodified units. The 2000 version of the TE transmitter allows the easy selection of 10 different RF frequencies and the receivers have been redesigned to scan all 10 frequencies to be able to link on any of them. Some people have mounted the original TE receiver in their trains to control power supplied by a battery. Since the TE is fairly large and batteries are large as well, both usually mounted in a "trail car" and provide power to the engine through a cable. The ART-5490 on board receiver is small enough to be mounted inside a locomotive. I have never used the original Train Engineer system, but many people have used them with good results. The system operates at 27 MHz. Programming was done with DIP switches inside the transmitter and on the receiver. The unit was claimed to handle 10 amps, but it never really could deal with that much current for any length of time. 3 to 5 amps is a more practical load.. Old style transmitters and receivers will work with the newer versions of the TE, however there are some restrictions. The receiver does not seek, so it will work with the newest transmitter only on frequency number 1. I have picked up some more information from other users. "I did not see many tips on this unit on your web site, so I thought I would share what I have found with you. A 10 amp auto type fuse soldered to the board inside near the power out terminals. 8 pin DIN connector for accessory control. No fan, however body is a large heat sink. Works great with old TE transmitter, some functions flaky with newest transmitter. 3 dip switches whose settings must match the dip switches inside the transmitter. 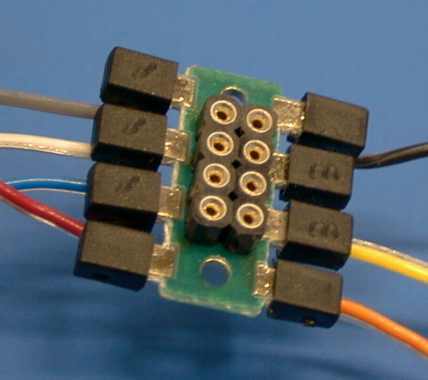 The DIN connector has 12 volts from a 7812 regulator, ground, and 5 function outputs which are normally low and go to 4-5 volts by depressing a-e keys and returning to ground when the key is released. There are 22k resistors in series with output so that they can not even drive an LED. A CMOS inverter chip and/or data latch are necessary to make use of these pins. An ART-5742 is designed to be connected to the DIN connector. For reference, A is at 11:00, B at 9:00, C at 7:00, E at 5:00, 12 volts at 3:00, and ground at 1:00." "I've had 4 of the 1st generation TE Receivers and 2 transmitters since May 1994. Two of the RX are used for track power, 2 are mounted in box cars and powered by battery. These units have been in constant service and I've never had a moments trouble with any of the components. There are still a good number of these 1st generation units in service in our club. When they first came out the 10 amp maximum rating was an issue. We finally got Aristo to admit that rating was a "momentary" rating. Fat lot of good that did! A number of us, after running operational tests, determined that the receiver was good for 5 amps continuous service. Anything above that load would cause the receiver to go into a shutdown mode. The train would still run, but very slowly and there was no response to the transmitter. You will note from the documentation that comes with the unit that the receiver is polarity sensitive on the input. Also there is an internal fuse. I've never blown a fuse. When one blows it is a bear to get into the case to replace the fuse. Those that have had to replace the fuse end up installing an external fuse so if they have any further need to replace a fuse it becomes a simple matter. You will note there is no delay when going from forward to reverse. Also no momentum setting. Biggest problem is with the no delay when changing direction. You have to get in the habit of bringing the engine to a full stop before changing direction. A few chages in direction while running at speed will possibly destroy a set of drive gears, especially if pulling a heavy consist. I would also recommend that you add an in-line fuze between the receiver and the track. This will help protect the internal fuze and save the need to go into the receiver to change a fuze. The metal case acts as a big heat sink. Keep the receiver in a location that allows for air flow around the receiver in order to keep its operating temp. down. The battery contacts in the transmitter are weak. If you drop it just right the weight of the batteries will collapse the contact springs and the transimiter will not function. George has a fix posted at his site should this problem come up. The receiver will align with any of the later edition transmitters, including the latest version. The ART 5472 accessory adaptor never did function as advertised. The ART 5474 Auxillary Distribution Panel works ok but has limited range. One last point, and this is true for any of the receivers, don't get them wet. If you do, take the receiver apart and dry it with a hair dryer. That's about it on the 1st generation TEs. I'm well satisfied with the units. They were a good value at the time of purchase and continue to operate in a most satisfactory manner." The second version TE, often called the "10 amp" unit, programs with somewhat more flexibility. Like the original version, the second version can generate up to 20 different track codes but on only one RF frequency. However it is easier to set the codes as the case doesn't have to be opened to do it. The instructions provided below conflict with the instructions and cautions provided by Aristo. I developed these instructions based on observation of how the system works and without any knowledge of the internal structure of the TE system. For example, Aristo cautions that all receivers except the one being linked should be turned off. I have determined by experiment that this is not necessary. Programming the TE system occurs in two distinct steps. First the transmitter is programmed to select a transmitter track code pair. This operation is done on the transmitter alone. Second, a receiver is linked to that transmitter. If two transmitters are programmed the same way (there are only 10 possible ways) then either transmitter can control a single receiver. Each transmitter has the capability of transmitting 20 track codes. The codes are selected in 10 pairs during transmitter programming. The 1-2 switch is used to select between the two track codes in each pair. This allows use of up to 20 different transmitter and receiver pairs to operate in a single system such that they will not receive each other's track codes. However, since all the transmitters operate on the same RF frequency, when two transmitters are on at the same time (the green LED on the transmitter indicates when it is actually on), they will jam each other and no codes will get through at all and the receivers will do nothing. If one of your operators likes to hold down the buttons, he will prevent anybody else from doing anything at all. Train him to change speed by pressing the buttons in a series of short jabs instead of one long one. This limitation is what prompted the newest 10 frequency version. 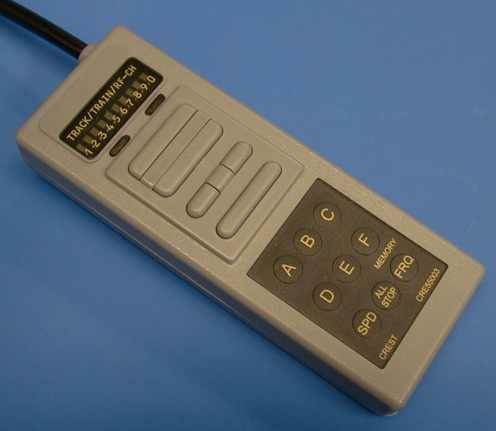 A transmitter track code is selected by pressing the A and B buttons at the same time (which puts the transmitter in program mode and causes the LED on the transmitter to flash) and then by pressing one of the ten buttons on the transmitter within 3 seconds. 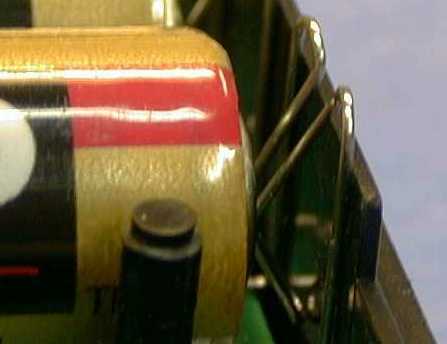 The button that is pressed determines the transmitter's track code pair. The position of the 1-2 switch is not significant during this operation. The transmitter then remembers this track code until it is reprogrammed, even if the batteries are removed. Since there are only 10 buttons available on the transmitter, there are only 10 ways to set it. A receiver is linked to a particular transmitter by pressing ANY button on a transmitter (this makes it send its track code) and then pressing the "code set" button on the receiver. While the code set button is pressed, the receiver will then listen to any track codes that it hears and accept that track code as its own. During this time, the LED on the receiver will flash. When the receiver has been linked, the LED on the receiver will stop flashing. In this case, the position of the 1-2 switch on the transmitter IS significant because it shifts the transmitter's track code between the two track codes of each pair. Momentum can be set while the receiver is being linked if the A through E button on the transmitter is pressed instead of just any button. "A" produces shortest momentum and the "E" produces the most momentum. I find that it is best to use the shortest momentum and to control the real momentum by pulsing the fast or slow button on the TX instead with quick taps. This allows other transmitters in the system to work between button presses. If two users are doing this at the same time, it is unlikely that all the commands will be jammed and both operators will see some response. You can indeed control 20 different receivers from a single transmitter without touching the receivers. To switch between the two receivers in the same pair, you need only to flip the 1-2 switch. To switch to one of the other 9 pairs, you need to use the "AB and another button" sequence on the transmitter. This form of switching is a little cumbersome which is another reason that the 2000 version of the TE was designed. A new version of the TE has just become available in November 1999. There are "spotting features" that allow the 2nd and 3rd generation units to be visually differentiated. The box has a picture of the 2nd generation unit on it, but there is a sticker that says "New 2000 Version." The transmitter has a row of LEDs along the top of the unit instead of the 1-2 switch and 9 buttons on the lower half instead of 5. The receiver looks almost identical, except there is simply a hole in the case next to the antenna wire where the old fan power terminals were. The new fan power connector is inside the receiver unit. The battery clips of the new unit are improved over the old unit. This design will probably not be as susceptible to breakage as the older battery connectors. The antenna is slightly longer than the older unit. I have made an informal check of the range of the new unit as compared to the older unit. It does seem to be somewhat improved. The difference seems to primarily be in the receiver unit. The new transmitter has the same train control buttons but it has nine buttons below the train control buttons instead of the previous five. These are labeled A through F, SPD, DIR and FRQ. The A-E buttons work as before. The F button is new, some new receiver may take advantage of it. The SPD button causes some of the LED indicators to light up to make a sort of a bar graph to indicate current loco speed. The DIR button causes the LEDs to scan indicating the current loco direction. The FRQ button causes one of the indicator LEDs to light indicating the current RF frequency. The newest version of the TE has the capability to transmit on 10 different RF frequencies. Switching between the 10 frequencies is done using the FRQ button on the transmitter. Up to 10 different transmitters can be used AT THE SAME TIME and not interfere with each other. This is especially important for large or club layouts. The original supplied instructions for setting the frequencies weren't completely clear. The FRQ button should be pressed for 2 seconds until a frequency indicator begins to flash. Then the FRQ button is pressed in sequence to step to a new frequency. To enter the new frequency, simply wait unit the indicator light goes out or press any other button on the transmitter. After than, pressing the FRQ button should light the indicator associated with the new frequency. The new transmitter can generate up to 10 track codes on each of the 10 RF frequencies so that up to 100 locos can be controlled (vs 20 for the older version) and it is much easier to switch between 10 of them. The older versions could be easily switched only between 2 locos. To switch between the track codes, press the buttons below the LED indicators to step up or down. It is no longer necessary or possible to use the "AB and another" key sequence to set the track code. This is done with the "track" indicators instead. Momentum is set on the 2000 version the same way as on the 2nd generation version. There is a new option set in linking to control the automatic delay when the direction is reversed while the train is running. Right after the code set light on the RX goes out, release the TX key that was held and press the A thru E key momentarily. A will produce the shortest delay, E the longest. The 10 frequency transmitter can control the older receivers, but only on frequency #1. 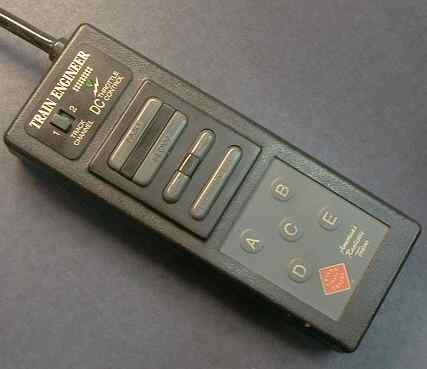 Depending on how you linked your old receivers to your old transmitters, you have a 50% chance of having picked a track code that the new transmitter cannot generate. It is also not obvious how the 10 codes of the new transmitter map to the 20 codes of the old transmitters. This information is necessary to figure out how to select transmitter track codes for both old and new units so that both can work together. Note that the ART-5474 and ART-5475 accessory control receivers currently only on frequency #1. When you originally programmed your 2nd generation TX, you pressed A and B for 3 seconds and then pressed one of the other ten keys. 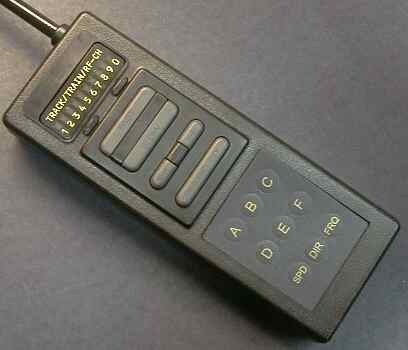 When you linked your receiver, you had the 1-2 switch set for either 1 or 2. The combinations resulted in 20 possible transmitter/receiver linked pairs. The new transmitter can only work with half of those pairs as shown in the table. Note that when new and old transmitters are used together, track 1 on the old TX is track 2 on the new TX and visa versa. Any RX that was linked to an old TX whose track code was set with the A through E key during transmitter programming cannot be controlled with the new TX unless it is relinked. If you programmed your old system with track codes pairs A through E, you probably should reprogram the whole system UNLESS you want to have an old receiver work EXCLUSIVELY with an old transmitter. By mixing the old and new codes you can actually control 110 locos. 100 of them will be accessible on the new TX, and 10 more with the old TX. The new receiver is nearly the same as the older unit, except that it has a scanning receiver (like the 5490) so that it can link to the new transmitter on all 10 frequencies. The new receiver will also link to all 20 track codes that the old transmitter can generate. The new RX does not seem to have the problem with a "flattened" response characteristic like the older unit. When the FAST button is held so that the speed is stepped past maximum, the loco's speed begins to decrease almost immediately when the SLOW button is pressed. With the older receivers, if you continued to hold down the FAST button after the loco had reached top speed, the old receiver would remember this and force you to hold the SLOW button for awhile before the loco would begin to slow. 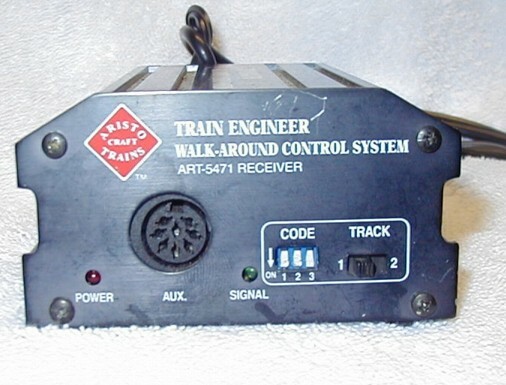 There are two models of Train Engineer onboard receivers for the TE System. Each of these has received a separate write up on other pages of this site, only the barest of description and a photo are shown here. Although the older receivers have been adapted by user to ride onboard, the first TE receiver especially designed for on board operation was the ART-5490 mini-receiver. This one is good for about 3 amps. The ART-5490 has been replaced by a newer version, the CRE-55491, that operates at 75 MHz like the HO Train Engineer described below. The receiver is adaptable, with an extra cost module, to work at 27 MHz as well. This one is also good for about 3 amps. It is specifically designed to plug right into the newer Aristo locos. Crest (AristoCraft) has released their "HO" version of the Train Engineer. This is a very small receiver that is intended to go into an HO locomotive and connect directly to the NMRA standard DCC socket if one is provided by the loco manufacturer. 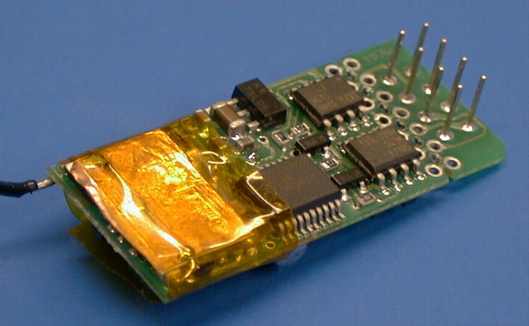 If no socket is provided, a solderable adapter board is provided by Crest with the HO TE. Crest doesn't rate the current handling capability of this receiver. I tested it with a typical large scale motor and it seemed to handle it ok. The input voltage of the HO TE is rated at 12 to 14 volts DC which means that it wouldn't work on a track powered system that is sized for large scale. The voltage would be too high and it might damage the HO TE RX. I also tested it with a 10 ohm resistive load. From a 14 volt DC source, the TE was able to output 12 volts into the load (1.2 amps). The rectifiers got pretty warm but they didn't burn up immediately. I did test it on DC and it works from 6.2 volts to 14 (the highest I tested it). It also works with a DCC signal on the track, I tested it at 10 volts RMS. This is good because it means that an RX equipped loco can work in an existing DCC system by using the DCC signal only as a power source. The back side of the RX board has the NMRA standard 8 pin interface. This plug arrangement is NOT keyed, it can be plugged in either way by design. Due to the pin assignments, it will work when plugged in either way. The power and motor pins are on opposite corners from each other. The headlight power and headlights are also arranged in a cross fashion. If the RX is plugged in "backwards," the motor rotation will be reversed, but the headlights will swap also so that the headlights and the loco direction will always match. This is assuming that the motor polarity is wired properly in the first place. If the headlights don't match the loco direction, reverse the motor wires at the motor terminals. Where an NMRA standard DCC socket is not provided, Crest provides a small board with an NMRA socket and wiring tabs. This one is wired with the standard NMRA color code (the wires are not provided by Crest). There are black plastic caps over the wiring terminals so that after a wire is attached, the cap can be reinstalled to insulate the terminal. Note that you have to use a VERY small amount of solder to attach a wire or the cap will not fit back on. The HO TE seems to be able to handle one typical large scale motor (not Crest's recommendation but it appears to work) so that the HO TE might be well suited to many small battery powered large scale locos where space is at a premium. The output waveform is PWC at about 16.6 kHz so that it is not recommended for coreless motors. The HO TE RX draws only 16 mA in standby so it doesn't have a significant static load. The headlights are constant intensity when they are on, however, they go off when the loco speed goes to zero. This is good for static current load. The lights come on at the first speed step usually before the motor begins to turn. The F button can be used to turn the headlights on and off. The RX is very small, probably the smallest RC RX currently available. The dimensions are listed in the table below with and without the adaptor board. If a particular installation is really squeezed for space, the wires can be attached directly to the DCC plug pins and the pins can be trimmed to minimize the overall height. The transmitter for the HO TE looks much the same as the 10 channel TE TX except that it is molded in gray plastic. Since the new TX operates in the 75 MHz band, it WILL NOT work with the older 27 MHz TE equipment. Crest will be releasing a new line of 75 MHz onboard receivers for large scale. It is my understanding that these new RX's are convertible between 75 MHz and 27 MHz to allow backward compatibility to the existing TE line. The HO TE comes in 75 MHz only to allow the shorter antenna wire that is compatible with HO sized equipment. I have been badgering Aristo for years about the reversing buttons on the TE. The absolute "left" and "right" arrow buttons were a pain in the backside. They finally converted the buttons so that either of them simply reverses the loco from whatever direction it is running in already. This will make Kadee uncoupler operation significantly easier. One annoying tendency that I did note with the TX (or maybe RX) is that the RX does not respond instantly to a button press. The button has to be held down for about half a second before the command takes effect. This could take a little getting used to. Programming the HO TE is a little different from the larger ones. Since mounting a code set button on an HO loco would be difficult, Crest has provided a magnetic reed switch to activate the code set sequence. If a magnet is passed over the RX, it goes into code set mode and the lights start blinking at a fast rate. It is important to have at least one externally visible light wired to the RX so that the progress of the code set mode can be observed. Since a magnet might not be handy to carry around, and even find when it is needed, Crest put on in the bottom part of the transmitter case. Just wave the bottom of the TX case over the loco to start the code set process. There are three parameters that must be set while setting the code. Just like the larger TE's, the TX must be set up first to the frequency and track code desired. Then the magnet is passed over the RX to start the headlights blinking. Holding down an A through F button will first set the momentum, A is zero momentum, F is the longest. The desired button must be held until the blink rate of the headlights slows. Then the reversing delay is set, again with one of the A through F buttons. A is shortest, F is longest. The button must be held until the blinking pauses for a second or so. Then a new parameter is set. Press and hold the A button until the lights to out to allow the TE RX to automatically return to its last programmed speed when it powers up. Using the F button to causes the TE to reset to zero speed when it powers up. Allowing it to resume speed will avoid resets due to short power outages. When set to zero momentum, I did notice that the TE motor speed seemed to be quantitized into 16 discrete steps. Crest's instruction sheets are typically cryptic, and the ones that came with the HO TE are no different. There are a few confusing paragraphs and some outright omissions that are worth noting. Figure 1 shows how to attach a filter capacitor to a typical HO power pack to smooth out the output voltage. The HO TE is sensitive to ripple on its power source and it won't run at all on some power packs. The diagram calls the item a "BP" capacitor which means bipolar. These are hard to find. If a regular polarized capactior is used it MUST be connected with the correct polarity or it will likely burst. The reversing switch on the power pack intended to provide constant track power should be taped over or disabled somehow to prevent accidental polarity reversal. The TE won't care, but the capacitor will. A series diode can be used to prevent such problems. Wire it between the positive power pack terminal and the positive capacitor terminal with the line on the diode package at the capacitor connection. With the diode installed, power will be delivered to the capacitor and the track only when the power pack polarity is correct. Like ANY DCC decoder, the motor leads (orange/gray, pins 1 and 5) MUST be insulated from all other wiring or the RX will likely be damaged. After the existing wires are removed from the motor, use an ohmmeter to check both terminals for continuity between the motor and ANY other wiring or structure of the loco. Any remaining connection must be identified and insulated. 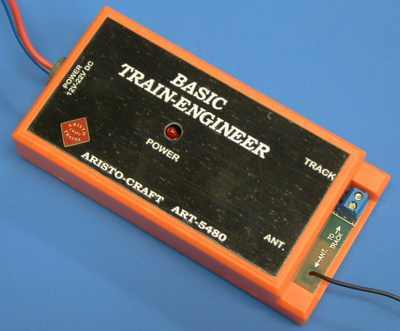 Another version of the Train Engineer is the TE Basic. This is a bare bones system intended for use by children. The RX and the power pack can be put aside and the kids don't have to mess with it at all. They can crawl all over the floor and run their own trains by radio control. The system is called "basic" because it is. All it will do is run one train. There is no programming, no code setting, no parameter selection. There is a fixed momentum set, it cannot be changed. The TE Basic will run one loco up to 2.5 amps. 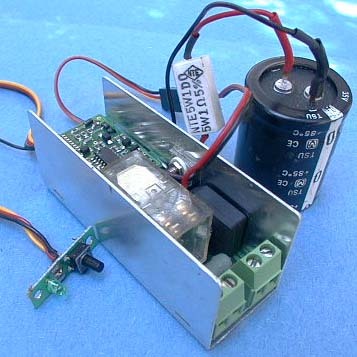 The power input is intended to run from a regular DC power pack from 12 to 22 volts. About the only thing that can be set wrong is the polarity. It won't work with the wrong polarity but it won't be damaged by the wrong polarity either. Several users have reported trying to use the TE Basic as an onboard system with less than satisfactory results. The range of the TE Basic is very limited. This is ok for its intended application but not acceptable for on-board use. The TX is similar to the regular TE, except that there are only the five basic buttons for faster, slower, direction and stop. The TX operates at 27 MHz, but uses different coding so that a regular TE RX will NOT link to it. Unlike the other TE TX units, this one takes a single 9 volt battery. There has been some considerable discussion on the internet about the voltage drop of the TE receiver under high load conditions. I decided to run a test and I find that the full throttle voltage drop is less than 2 volts in PWC mode all the way to 10 amps. There seems to be a little more drop using the Linear setting. The load resistance was varied from 4.06 down to 1.34 ohms. The test setup is pretty direct. 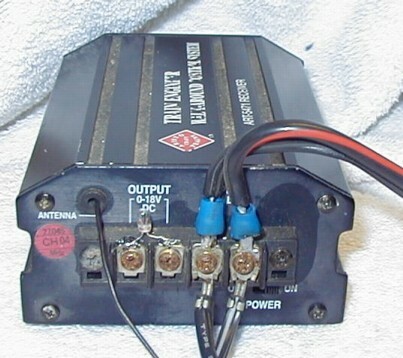 An Ultima power supply (an older one that outputs only about 20 volts under no load) was used as a source to drive a 2000 version TE receiver. The input voltage was monitored with a DC voltmeter. 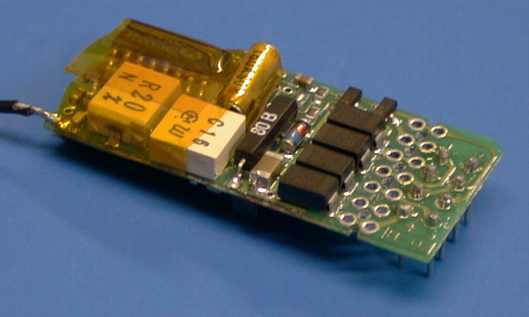 Several different load resistors were used to load the TE. The TE was run up to full throttle for these tests to determine what the parasitic voltage drop when the highest speed operation is desired. The tests were done with digital voltmeters with 0.1% resolution and uncertain accuracy. Since the result was derived from four different measurements, the total accuracy of the measurement is not real good, but is probably better than 5%. All the wiring that came with the TE and Ultima was used so its voltage drop is included in the measurement. The load itself was connected directly to the output terminals of the TE so that there is no voltage drop to represent wiring to the track. The different current levels were derived by using different resistive loads for the tests. Various serial and parallel combinations of power resistors were configured and then their total resistance was characterized with this Kelvin probe type of measurement. The power supply was set to drive three or four different current levels into the load and the voltage was measured for each current. A resistance was then calculated which was usually consistent to 0.1% for the different currents. The highest test current was done at or above the current expected during the TE tests so that thermal non-linearities of the load were determined and found to be insignificant. The older Train Engineer transmitters have a problem with their battery contacts. The material that the contacts are made from has poor stress-strain characteristics and do not tolerate being bent. They will work harden, crack and break after a couple of small bends. Normally, this is not a problem. The problem occurs if the TE is dropped. The rest of the unit is able to handle the shock of bouncing off a concrete patio, but the contacts often do not handle it well. The mass of a battery combined with the shock may deform the contact such that it no longer reaches far enough to touch the battery and the TE stops working. If the contact is bent back and it doesn't actually break off, then the unit will start working again. The contact work hardens during the bend and probably cracks as well. It is then weaker than it was before. Drop it again, and then the contact may break right then or it may break when it is bent back again. There is a way around this problem. The first time that the contact is damaged, inspect it carefully. There is probably a crack starting along the top of the contact. If you bend it back and it breaks, it can be soldered back on, but its really hard to hold it in place during soldering. Instead, solder it BEFORE it breaks while it is still holding itself in position. 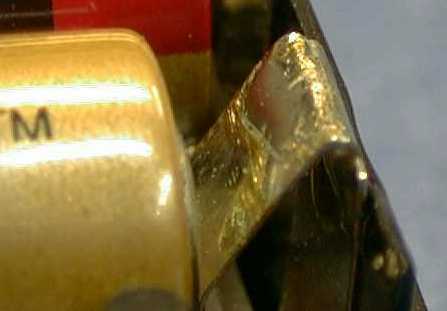 It is most important to get a fillet of solder to flow UNDER the sharp bend at the top of the contact. Then the contact can be bent back and the spot that usually breaks will be reinforced with solder. The TE 2000 TX battery contact has been redesigned so that there is no spot that is undergoing serious stresses so that is not likely to work harden and fracture.